By Paul Deng in Economy on April 30, 2010 . On April 25, the World Bank again restructured its voting share among countries. The new structure reflects the rising power of developing and transitional economies, especially China. 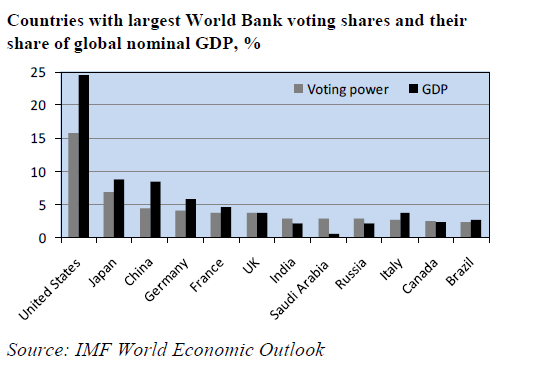 Now the voting share is more aligned with country’s GDP share in the world. China’s voting power was increased from 2.27% to 4.42%. The similar reform is also widely expected at IMF. 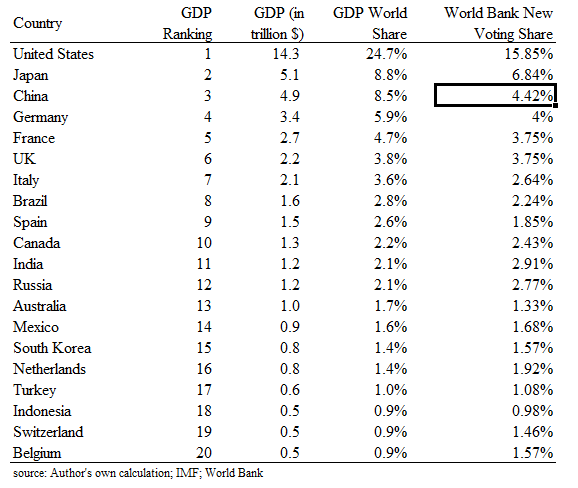 Here is a chart I made that compares country’s GDP share with their voting power at the World Bank. link to the report on the reform. Bank of Finland has a nice chart similar to my table above, comparing GDP share with voting power for the top 12 countries.